By Wags, about F/A-18C Hornet module develop. We hear you and understand your wish for more news about the Hornet project. Virtually all the work is in code at this time, but I can say that work continues and the electrical, hydraulic, and gear systems are all almost complete. The next step will be to tie these systems into the cockpit. Other systems have been tied to the cockpit and the HUD symbology integration is on-going. Once that task is complete, we can begin work on the flight model prototype. The cockpit is done though and includes functionality for JHMCS. What weapon systems will be included in the Early Access is TBD. As mentioned earlier in the year, it’s our hope to release the Hornet into early access by the end of the year. However, that is only a best estimation at the time and many things can alter this. Only a date announced with the start of a pre-purchase should be taken as a date you can bank on. We are quite accurate with such dates. When there is more information to pass along on this project, we will do so. In FY98, Lot 20 series F/A-18C/D Aircraft were delivered, integrating the Phase II AN/APG-73 RUG, ATARS, Joint Direct Attack Munitions, Joint Stand Off Weapon, and EGI to meet the precision navigation capability that future weapon systems require. EGI provides an all-altitude, worldwide source of navigation and attitude information. 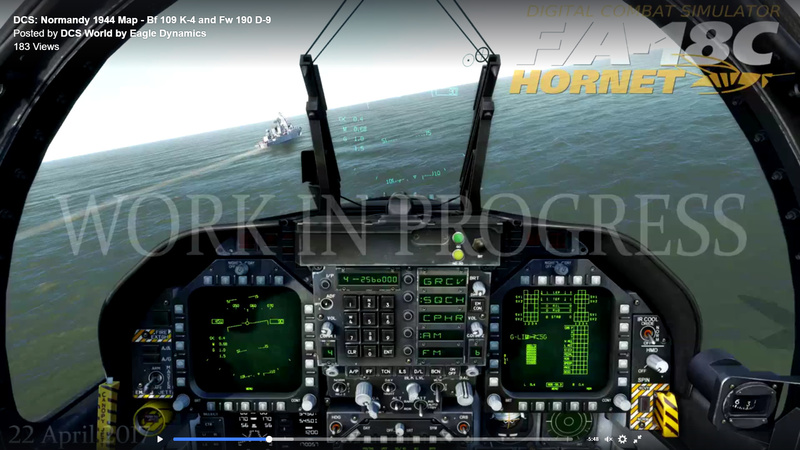 by Wags.....little update about F/A-18C develop. I'd love to but I'm neck deep in the Hornet manual and systems implementation with the SMEs (we have two Hornet pilots that also play DCS) and engineers. is there any update if the F-18 includes full carrier operations (full modeled operations on the deck/landing) or is that already clear ? Has into the plans, but none new info has coming about that features (has planned new and feature updated carrier as a optional module on the future). New news on the Hornet project will be made available a few weeks after the release of the Normandy 1944 map. In the meantime, the Hornet is under VERY active development. oh no, that looks just so awesome ! Lausanne, Switzerland, May 29th, 2017 - DCS: F/A-18C Hornet to be unveiled at E3 2017! Eagle Dynamics SA and Belsimtek are excited to announce that DCS: F/A-18C Hornet will have its debut showing at E3 2017 at the Thrustmaster® booth. DCS: F/A-18C will be by far the most authentic PC simulation of a modern fighter to date, and it will use unique CFD engine and aerodynamics developed by Belsimtek. Based on exhaustive research in association with Boeing, current fighter pilots and the development of our new simulation engine, the DCS: F/A-18C Hornet will set a new benchmark. Eagle Dynamics SA senior producer, Matt Wagner, states, “We are happy to announce the cooperation between Eagle Dynamics SA and Thrustmaster® to create the ultimate F/A-18C Hornet simulation experience”. “After the success of our first collaboration with Eagle Dynamic SA on DCS: A-10C Warthog, that lead to the HOTAS Warthog, we are proud to start a new collaboration on the DCS: F/A-18C Hornet”, says Gilles Raulet, Thrustmaster Development Director. Please stop by the Thrustmaster® booth South Hall #2813 and experience the next level of combat aviation simulation! Digital Combat Simulator World (DCS World) is a free-to-play digital battlefield game. Our dream is to offer the most authentic and realistic simulation of military aircraft, tanks and ships possible. The free download includes a vast mission area of the Caucasus region and Black Sea that encompasses much of Georgia. It also includes the flyable Russian Sukhoi Su-25T ground attack aircraft and the famous WWII North American TF-51D fighter. The download comes with the most powerful mission planner ever designed, full network play and more than 145 AI weapons systems, 113 ground vehicles and trains, 16 Ships and 73 AI aircraft permitting you to plan and play highly sophisticated missions. DCS World is massively extensible through additional DCS modules as well as user-made add-ons and mods which you can purchase and download from our site. DCS is a true "sandbox" simulation that is also designed to cover multiple time periods of interest such as WWII, Vietnam, Gulf War and others. As examples of products progressing to completion for DCS, "Normandy 1944" is in final phase of development and "Persian Gulf" is close behind. DCS World is fundamentally a deep, authentic and realistic simulation game designed also to offer a more relaxed game play to suit the user and his particular level of experience and training. The ambition is to hand hold users from novice pilot all the way to the most advanced and sophisticated operator of such complex weapons systems as the A-10C or the Mirage 2000C. The only next step is the real thing! The HOTAS WARTHOG™ joystick is the result of an intense collaboration between Thrustmaster's development teams and members of the simmer community. Exchanges and studies were carried out constantly throughout the product's development phase, in order to create a joystick which meets the most specific and precise requirements of the experts. The result is a replica set of the joystick, dual throttle system and dual throttle control panel of the U.S. Air Force A-10C attack aircraft. With T.A.R.G.E.T software that allows for total interaction between different Thrustmaster USB controllers, with simplified configurations in simulators, and the use of a single preset for all controllers, The HOTAS WARTHOG™ joystick is ready for an enlarged ecosystem including among other development, new Add-On for Joystick.